Digital technologies have revolutionised not only how knowledge is used, but also how it is created. In this project, we deal with the theoretical and philosophical understanding of so-called knowledge machines and knowledge elicitation. Knowledge elicitation is a set of techniques for eliciting the knowledge of a domain expert, typically by interacting directly with the expert. In our work, we have adapted knowledge elicitation techniques to support the conceptual analysis and categorisation of social machines. Knowledge machines are a specific class of social machines, namely those that generate knowledge as their outputs. 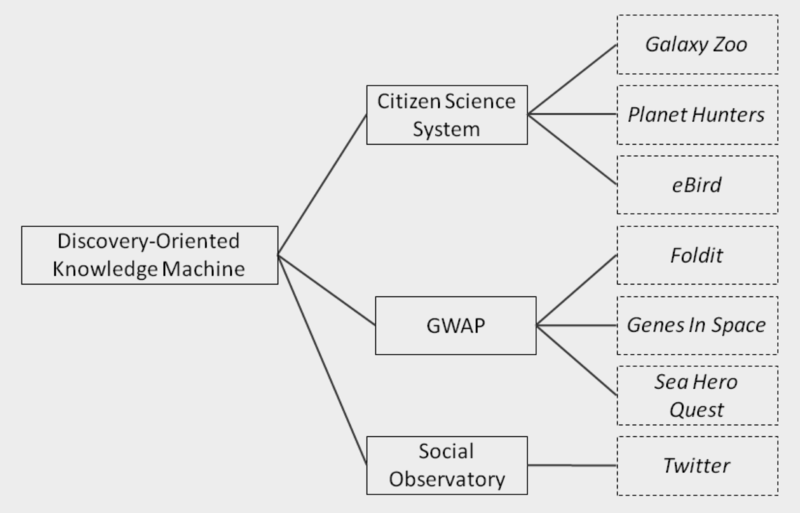 Particularly important examples of knowledge machines are citizen science systems (e.g., Galaxy Zoo) and online games that support the process of scientific discovery (e.g., Foldit). One of the aims of this project is to determine the kinds of knowledge machines that exist. Important categories of knowledge machine thus include those related to knowledge discovery (e.g., Galaxy Zoo), knowledge acquisition (e.g., Wikipedia), and knowledge representation (e.g., OntoGame). A second aim of the project is to explore the links between knowledge machines and work in contemporary epistemology. Knowledge machines are cast as a particular kind of socio-epistemic system, one whose informational outputs stem from the operation of reliable (socio-technical) mechanisms. This establishes a potentially fruitful point of contact with work in systems-oriented social epistemology and applied epistemology. Smart, P. (2018). Knowledge machines. The Knowledge Engineering Review. 33(e11), 1-26. Shadbolt, N., & Smart P. (2015). Knowledge Elicitation: Methods, Tools and Techniques. (Wilson, J. R., & Sharples S., Ed. ).Evaluation of Human Work. 163–200.